During an illustrious four-decade career at NPR and PBS, John Merrow—winner of the George Polk Award, the Peabody Award, and the McGraw Prize—reported from every state in the union, as well as from dozens of countries, on everything from the rise of district-wide cheating scandals and the corporate greed driving an ADD epidemic to teacher-training controversies and America’s obsession with standardized testing. Along the way, he taught in a high school, at a historically black college, and at a federal penitentiary. 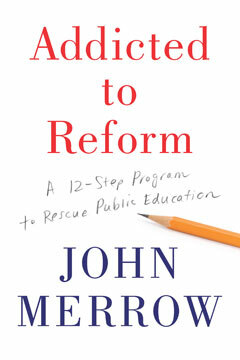 Now, the revered education correspondent of PBS NewsHour distills his best thinking on education into a twelve-step approach to fixing a K–12 system that Merrow describes as being “addicted to reform” but unwilling to address the real issue: American public schools are ill-equipped to prepare young people for the challenges of the twenty-first century. This insightful book looks at how to turn digital natives into digital citizens and why it should be harder to become a teacher but easier to be one. Merrow offers smart, essential chapters—including “Measure What Matters,” and “Embrace Teachers”—that reflect his countless hours spent covering classrooms as well as corridors of power. His signature candid style of reportage comes to life as he shares lively anecdotes, schoolyard tales, and memories that are at once instructive and endearing. Addicted to Reform is written with the kind of passionate concern that could come only from a lifetime devoted to the people and places that constitute the foundation of our nation. It is a “big book” that forms an astute and urgent blueprint for providing a quality education to every American child.